Rochester Clinical Research recently conducted the REWIND research study for Trulicity (dulaglutide). 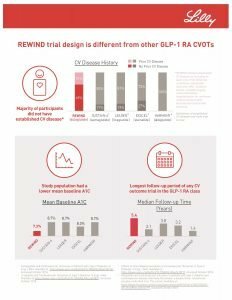 The REWIND study is assessing whether Trulicity could protect people with type 2 diabetes from experiencing an initial cardiovascular event. Also, it could prevent future events in those who have established cardiovascular disease. Trulicity is a once-weekly injectable prescription to improve blood sugar in adults with type 2 diabetes. Approximately 30 million Americans have diabetes. Type 2 diabetes is the most common type internationally accounting for an estimated 90-95% of all diabetes cases in the US alone. RCR started the research study in 2017 and finished the study in the middle of this year. The study found that Trulicity significantly reduced major adverse cardiovascular events (MACE), a composite endpoint of cardiovascular death, non-fatal heart attack or non-fatal stroke, meeting the primary efficacy objective in the research study. To learn more about the study, click on the link to the original press release or the infographic below. Trulicity is a registered trademark owned or licesed by Eli Lilly and Company. While this article contains forward-looking statements about Trulicity (dulaglutide) as a treatment for type 2 diabetes and as a potential treatment for the reduction of cardiovascular events, it reflects Lilly’s current belief.